Magnificent Mediterranean wedding cream ‘Purity’ garden roses from David Austin wedding & Gift Roses are dusted with tones of pale apricot and combined with white dendrobium orchids. 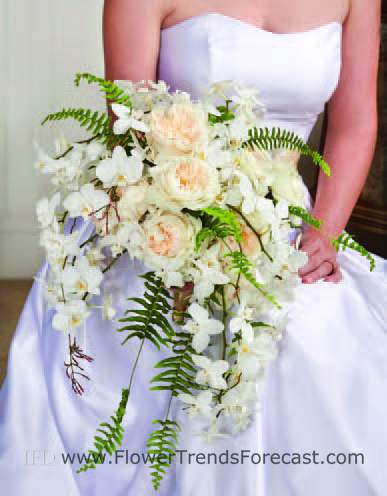 An Oasis ELEGANT® Bouquet Holder pulls this look together and creates a timeless, romantic freeform cascading bouquet. This warm, inviting trend emulates the bride’s distinct, alluring personality and sets the stage for her to be the most romantic bride. 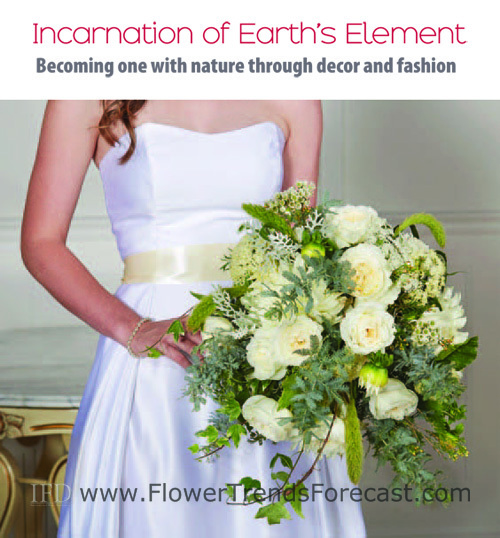 Incarnation of earth’s element wedding classic wedding bouquets delight the Incarnation of earth’s element bride. The trend has a modern edge as it leans toward browns, greens, and whites. 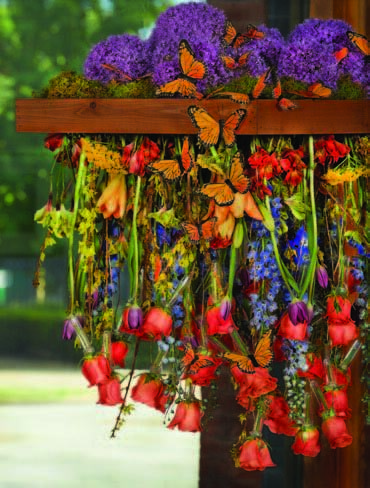 These bouquets use a variety of textured foliages to showcase an appreciation of nature. This freeform bouquet uses ‘Patience’ roses from David Austin Roses, white peonies, and an array of textural fillers and foliages. 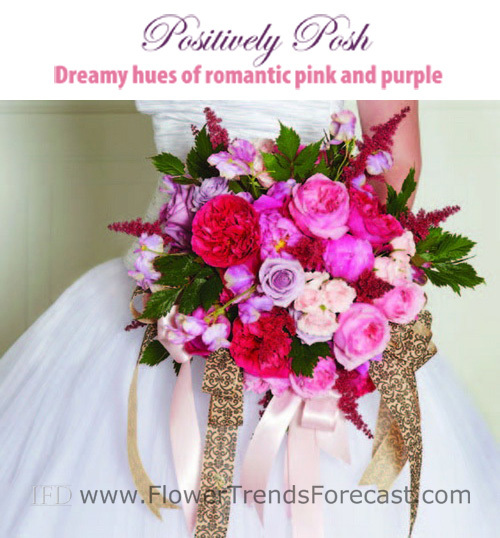 Positively Posh wedding is passionate and feminine. Positively Posh is about discovering uniqueness and style. Delicate elements set against deep velvet and plum tones create a romantic couture look. Grays, pinks, and light neutrals contrast with bursts of vibrant fuchsia and purple hues. Freeform bouquets wondrously exemplify the radiant affection that envelopes Positively Posh. 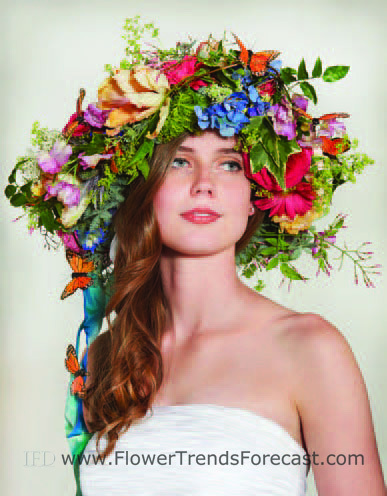 Folk Art Reinvented wedding where natural elements balance the bright color spectrum in Folk Art Reinvented. The trend entices the bride with an explosion of mixed, bold colors and encourages her to take the garden style to new heights. Bouquet designs will vary in size, shape, and flower choice, but none will outshine the freeform bouquet pictured here. 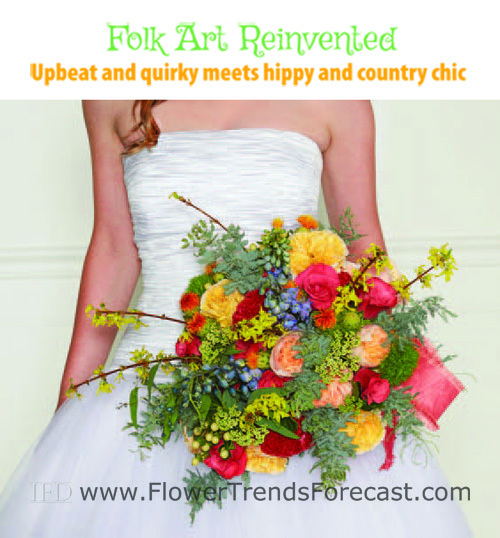 A well-balanced mix of colors, shades, flowers, and accent foliages is key to creating the ideal Folk Art Reinvented freeform cascading bouquet. Once again gracing the bridal industry with its presence, freeform cascade floral bouquets are a favorite amongst modern brides striving to boast an eccentric take on a classic styling. with their unrefined ambiance and eye-catching shape, these contemporary bouquets deviate from the typical, compact arrangements and emulate the bride’s distinct and alluring personality. 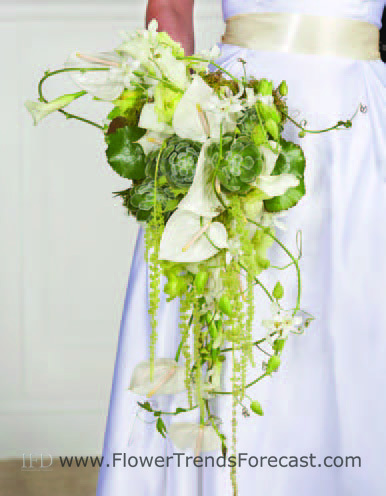 Textured bouquets replace bright, monobotanical sprays as brides utilize advanced weaving techniques and floral choices. For the bride captivated by the Mediterranean coast, rich orange, blue, and gold join muted beige and cream tones to convey a life steeped in meaningful history. Brides who love all things trendy will relish a textured freeform cascade bouquet’s potential with its updated, natural appearance and ideal representation of their one-of-a-kind character. Individuality prevails as brides aspire to have their wedding exhibit their eclectic charm. Flamboyant archways, floral chandeliers, and wall decorations are an excellent way for the bride to express her quirky side and embrace a creative twist on ageless designs. exquisite archways brimming with elaborate origami motifs capture the extraordinary, spirited couple’s combined identity and promising future. Floral chandeliers flawlessly adorned with radiant citrus fruits and ruffled flowers represent the bride’s exuberant side. Magnificent floral wall decorations showcase the bride’s idiosyncrasies as they are embellished with bountiful flowers in a copious range of colors. These lavish accents allow the bride to effortlessly accentuate her timeless spanish mantilla veil, lace bell sleeves, and any other chic elements she adds to her gown. Nature’s calming spirit continues to dominate the wedding industry as more brides incorporate an assortment of rustic elements to their special day. Gorgeous gardens entice the bride to take the outdoors to all new heights with living greenery centerpieces and bouquets bursting with organic succulents, seeded eucalyptus, and dusty miller. The subdued shades of these wondrous plants force pure white blooms to work in new and exciting ways underneath elegant terrarium and cloche encasements. The impeccable accent to a historic Mediterranean wedding and the quaint accessory to a fashionable natural ceremony, living greenery centerpieces deliver a variety of possibilities. These graceful floral formations easily fit into the environment of the day with their soft elegance that matches the bride and her prominent beauty. Today’s brides morph tradition with modernity as they sprinkle their unique disposition throughout popular floral selections. 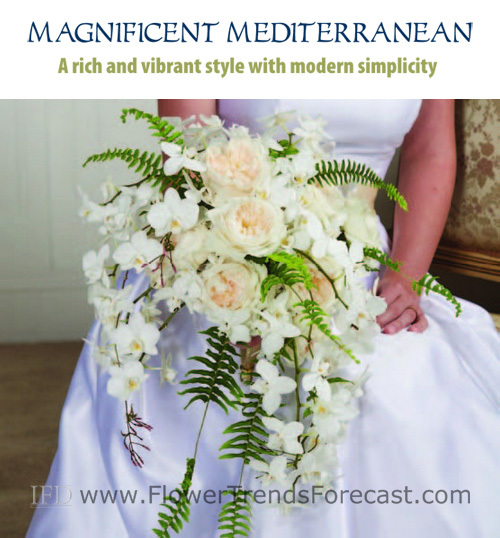 Golden sunflowers, rust-colored lilies, and green Bells of Ireland will effortlessly blend with fresh citrus fruits, olives, and vines in bouquets inspired by the Mediterranean coast. Brides aiming to add a whimsical romanticism to their ceremony will adore a plentiful bouquet filled with rose, peony, and gerbera daisy blooms in an endless array of purple and pink hues. Nature-loving brides will redefine the common conception of nature as they weave interesting greens amongst delicate white viburnum, amaryllis, and jasmine blooms. Brilliant rainbow roses, pink dahlias, and orange calla lilies mixed with white gerbera daisies and pansies provide the bride with the perfect splash of color that will grab everyone’s attention.